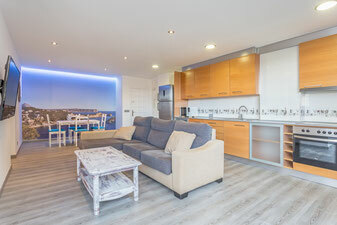 We recently got this new apartment in our offer for rent on a great location in Javea, next to the Arenal with the sandy beach and boulevard with shops, restaurants and bars. The apartments is completely renovated and modern decorated, has an open plan living/dining room with American kitchen, 3 bedrooms and 2 bathrooms. More information you can find here. As this apartment is new for rent we still have some availability for July and August! Do not hesitate to contact us for availability and prices.